Leuzinger High School is the only school in The United States authorized to use the olympic name and the five-ring emblem. The first graduating class received their diplomas in 1932. In that same year, the City of Los Angeles hosted The Summer Olympic Games... and Leuzinger requested and received authorization for the use of The Olympic name. It became official again in 1984 when Peter Uberroth of The U.S. Olympic Committee gave it his blessings. Leuzinger High School was named after Adolph Leuzinger who came to America from Switzerland with his family in 1867. They settled in Kansas. In 1883, they purchased a farm in Southern California where Hyde Park and the City of Inglewood now exist. Adolph married Emma Louise Bollinger in 1893. Emma was a Wisconsin girl who came to California with her parents by way of Missouri and The Dakotas. She met her husband-to-be through her father... who in turn met Adolph at the Los Angeles hay market. Together, they had three children; John, Louis, and Arthur. Adolph Leuzinger was easily identified in local affairs and banking circles. In 1896, Adolph was appointed to the first board of the newly formed Wiseburn School District. At the time, he was working on the Daniel Freeman Farm in Ingleood. CA. In 1905, Mark Keppel the superintendent of schools appointed Adolph to the position of finding a site for a high school. The site he located is where Inglewood High School sits today. Adolph became vice president and director of First National Bank in Inglewood. When that became a branch of Security First National Bank of Los Angeles, he became a member of the executive board. The Inglewood Union High School District was formed in 1905, and Adolph was appointed to The Board of Trustees. For 25 years, he served in that position and never missed a meeting. In 1924, the trustees approved the purchase of several acres for a new high school in Lawndale. The cost of the purchase... $15,750. The Board of Trustees approved the motion to name the new school 'Adolph Leuzinger High School.' He protested in fear that no one would be able to pronounce his name. The main reason he was so strong for education is because he never had the opportunity to attend school a day in his life. 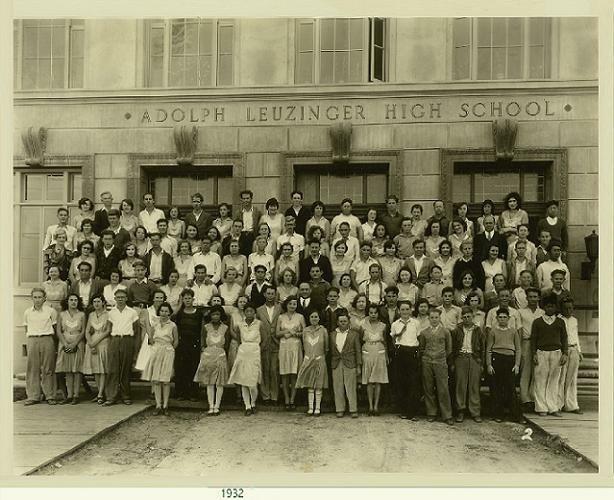 Leuzinger High School opened its doors on Jan 27, 1930 with a student body that consisted of 275 students. The school was formally dedicated on March 5, 1930 with Adolph in attendance. He died the following year. The first principal was George M Green who was also superintendent of the district. After a few years, Harold Simar became principal. Vern J Rice assumed the role from 1939 to 1960. Back in 1932, many athletes used the Leuzinger athletic field and gymansium for Olympic training. The Japanese wrestling team used the gym for workouts. Foy Draper who taught at Leuzinger in the late 1930s and 1940s was an Olympic gold medal winner in The 1936 Berlin games. He was a member of the Olympic record setting 400-meter relay team along with Ralph Metcalf, Frank Wycoff, and the great Jesse Owens. Foy lost his life serving in the armed forces during World War II. The Leuzinger Family began selling its land in 1949 because taxes were too high to make farming possible in an industrial district. If Leuzinger High School's alumni could question with their hearts as well as with their eyes and lips, they could learn a great lesson about America just by studying the life of Adolph Leuzinger.